^ The Block Cookies functionality has been improved and many issues have been resolved. + A very useful helper guide to help you understand how to block cookies, has been added inside the plugin parameters, under the Block Cookies parameter. 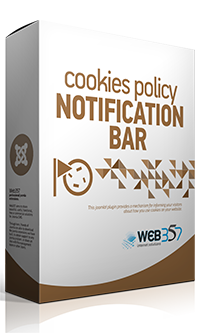 + A new parameter has been added to display a message to the user if there are blocked cookies. By enabling this option a notification message will be displayed at the frontend, on each position of the blocked script. * You can change the text of the notification message from the language overrides in Joomla! backend.
! Some parameter fields about blocking cookies have been removed because this functionality has been changed. # Minor CSS issues have been resolved. Tutorial: How to block the cookies in Joomla!